Low heat keeps the egg white from burning or discoloring. The thick, runny yolk and tender but firm whites of a sunny side-up egg make it a welcome breakfast treat if you master the cooking method without breaking the yolk. Flipping the egg during cooking often results in an overcooked or broken yolk. Steaming the eggs in the frying pan allows the entire fried egg to cook properly without the need to flip, which simplifies the process and results in a perfect yolk when serving. Add enough olive oil or melted butter to a frying pan to coat the bottom. Heat the pan over medium-high heat until the oil heats up, but avoid overheating, which results in bubbling or smoking. Crack the egg and slip it into the pan quickly so the yolk remains centered in the white. Add eggs one at a time. Lower the heat to the low or medium-low setting and cover the pan. Cook the eggs covered for five to six minutes, or until the whites are firm and the yolks begin to thicken. Hold the pan at an angle above the serving plate. Slip a spatula under the eggs and slide them out and onto the plate. 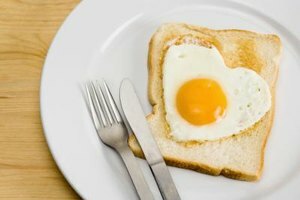 Blot the top of the sunny-side-up eggs lightly with a paper towel to absorb any excess oil, but avoid blotting and breaking the yolk. Season sunny-side-up eggs with salt and pepper before covering and cooking or after plating them. Paprika, red pepper flakes and thyme all complement the flavor of the eggs. Sunny-side-up eggs and other recipes that feature undercooked eggs increase salmonella risks. 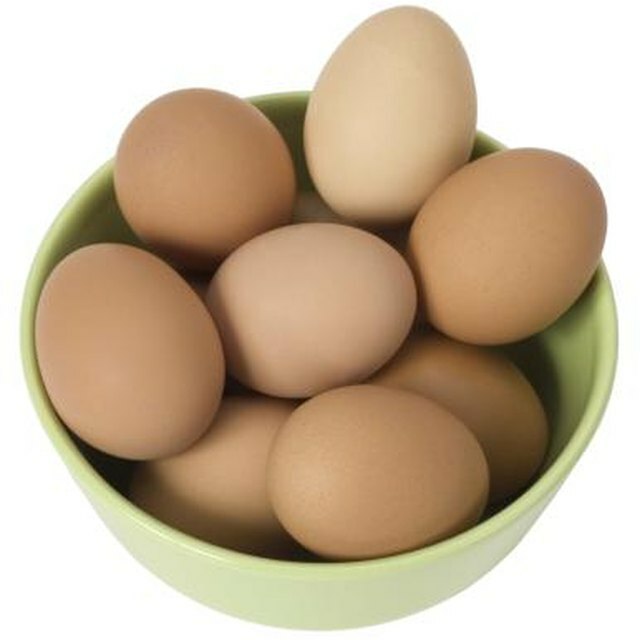 The Federal Food and Drug Administration recommends using only pasteurized eggs or eggs treated to prevent salmonella. What Is the Difference Between a Fried and a Poached Egg?